Mega Mewtwo Y was the first Mega Pokemon unveiled. It gains the Insomnia ability when it Mega Evolves, which prevents it from falling asleep. 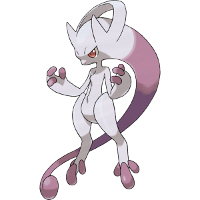 It's exclusive to Pokemon Y and evolves with Mewtwonite Y.